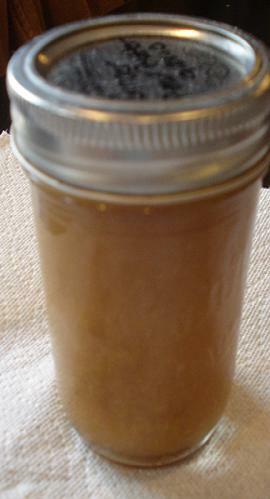 Ginger Pear Butter - Canning Homemade! Somewhere in the shuffle there are a few recipes that got mistakenly deleted from the site that were really great canning recipes and I wanted to re-post them in case there was some interest. I also wanted to have record of them in my canning recipes collection. The first one to add is the Ginger Pear Butter. It came out really flavorful and I finally finished the last jar of this butter last month. The ginger was great with the pears and the consistency of the pear butter was smooth and silky. Enjoy! Combine all the ingredients in a stainless steel or enameled dutch oven. Cook 60 minutes at a simmer till everything softens. Continue to cook another 1 to 2 hours stirring occasionally to watch for a thick consistency. Using a food mill or immersion blender smooth out the mixture and re-add to pot. Once it is thick like applesauce, fill sterilized jars leaving 1/4 inch headspace. Remove air bubbles, refill to headspace if necessary. Wipe rims, add hot lids/rings and process in water bath for 10 minutes once the water has returned to a full boil.